This post is sponsored by Chicken of the Sea®. 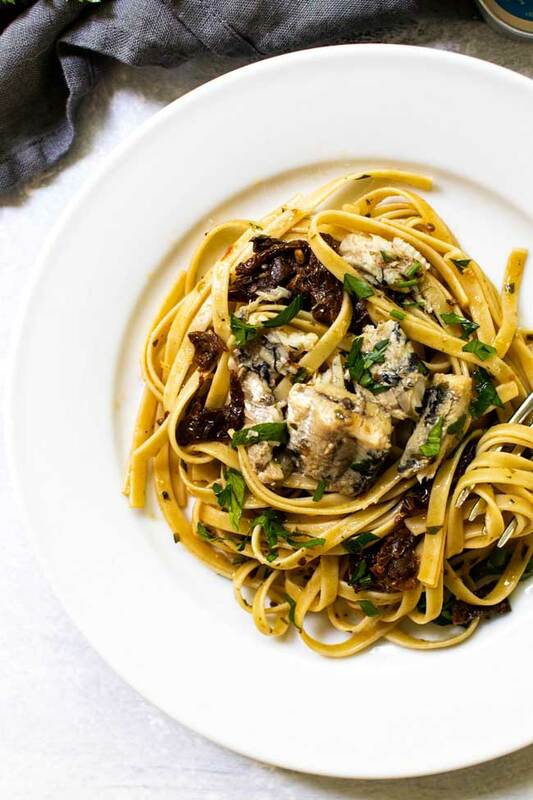 I received monetary compensation, as well as free product, in exchange for developing and sharing this easy 20-Minute Sun-Dried Tomato Pasta with Sardines recipe. I dedicate today’s post and recipe to my grandpa Oscar because he loved sardines. And I should mention I don’t often dedicate a post to someone – like you might do for a song, or book, or other creative endeavors – but, when I set out to create a recipe using sardines I couldn’t help but think of him sitting at the kitchen table in the little bungalow my grandparents shared for years. It was there he would peel back the lid on a can of sardines for an occasional afternoon snack. At the time it seemed so exotic. He immigrated to the US from Belgium as a child and my 7-year-old-self figured his family packed the little tins of fish in their bags along with all the other life necessities. My mom didn’t keep sardines stocked in our family’s kitchen, so I could only assume those packs of fish were rare because he relished every bite and he never offered to share. It was just him, his sardines and an ice-cold home-brewed beer. Oh, and his rapt audience of one, also known as his favorite granddaughter an honor I cherished until someone reminded me I was his only granddaughter. And like so many ideas that change as we grow older, I learned that grandma bought a few cans each week at the grocery store and they weren’t, in fact, smuggled into the country in the pockets of my grandpa’s family. But, as I write this, I can’t shake the feeling of their special-ness and that they are a delicacy tucked into the shelves at my local grocery store. To my grandpa, they were as good as caviar. I think my grandpa would like what I’ve done with his beloved sardines. Oh, he might think there’s a little bit of fussiness – he was a straight from the can man, after all – but he was the one who taught me how to swirl pasta onto my fork, a skill that wowed me at the time, so I’m pretty sure all of this would make him smile. 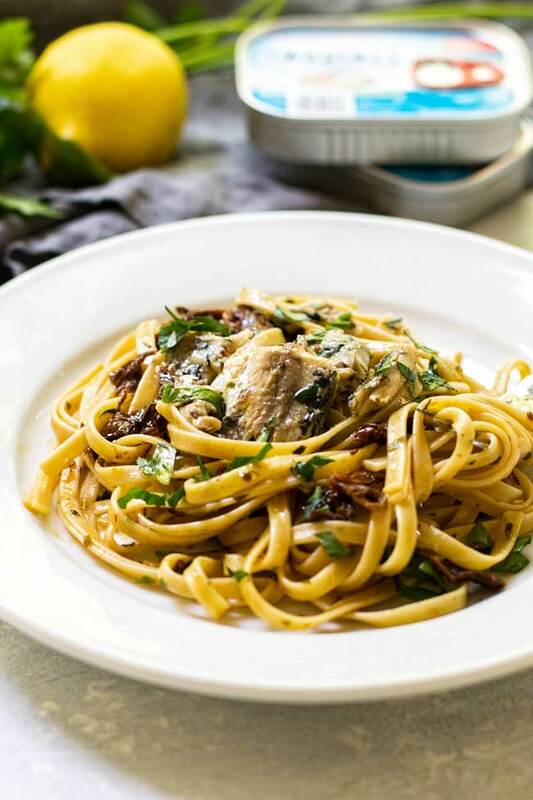 And so this pasta with sardines recipe is really just a mash-up of old childhood memories and things I love today like pasta, fresh herbs, bright lemon, and sweet sun-dried tomatoes. It’s a quick and easy 20-minute dinner inspired by flavors I experienced during travels to Italy over the last few years with a nod to my grandpa’s favorite snack. Sardines: Childhood memories aside, there are so many reasons to keep sardines stocked in the pantry. 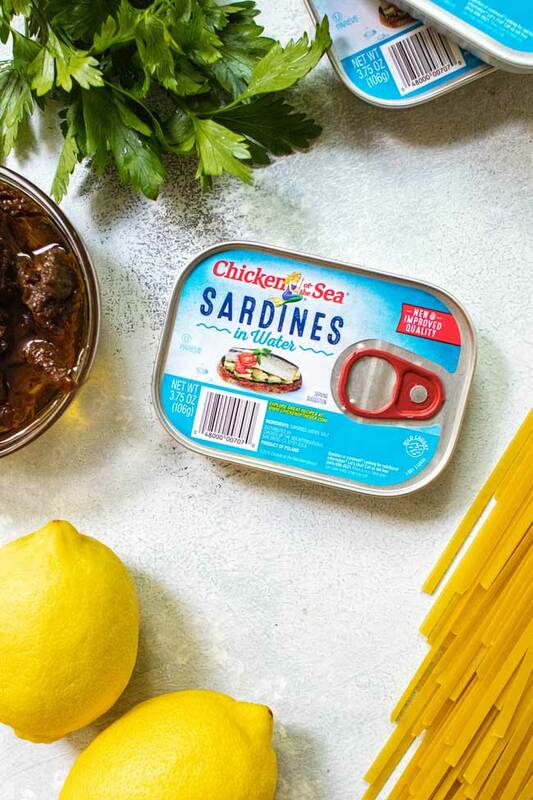 Sardines from Chicken of the Sea® are wild-caught and the company promotes sustainability practices for all of their products. Plus, sardines are packed full of good-for-you things like omega-3s and other healthy nutrients. And (and!) they’re economical. Look for them near the canned tuna at the grocery store. Pasta: I used linguine, but any long pasta that you can twirl onto your fork will work well. Sun-dried tomatoes: Buy the ones packed in oil and give them a good chop before adding them to the pan. Lemon juice: The sauce for this pasta is so, so simple. The lemon juice mixes with the olive oil and a little of the starchy water that hitches a ride on the hot pasta. It’s a nice balance to the oil-rich sardines. Fresh parsley: I like to add it right at the end before serving. It adds a pop of color and fresh herb flavor. Tortellini Tuna Casserole | This tortellini tuna casserole for two is a twist on a classic tuna casserole. The creamy from-scratch sauce is made with fresh mushrooms, white wine, and garlic and is tossed with cheese tortellini and peas. Plus, there’s no need to boil the pasta – it cooks right in the sauce while in the oven. Baked Chicken Parmesan Casserole | This baked chicken parmesan casserole for two is a low-prep dinner that takes all of ten minutes to get in the oven. All of it – including the pasta and chicken – cook together in one baking dish so there’s no need to use different pots and pans to boil the pasta and bread and fry the chicken. Bucatini all‘ Amatriciana | Bucatini all’ Amatriciana is a delicious pasta dish that takes less than 30 minutes to make. My version for two has pancetta, tomato sauce, a splash of balsamic vinegar and a generous pinch of crushed red pepper. 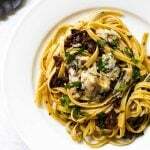 Serve the sauce with bucatini for a quick and easy weeknight dinner. Simple sardines dressed up with pasta, fresh lemon, parsley, and sweet sun-dried tomatoes. Bring a pot of water to a boil over high heat. Boil the pasta according to the package instructions. Heat the olive oil in a 10-inch skillet over medium heat. Add the garlic, sun-dried tomatoes, and the extra oil from the tomatoes. Cook the tomatoes for about five minutes or so and then turn the heat to low to keep it warm while you wait for the pasta to boil. Break the sardines into pieces and add them to the pan. Add the lemon juice to the tomatoes and stir. Transfer the hot pasta from the water to the skillet using tongs. Toss the pasta in the lemon juice and tomatoes. Add the parsley and toss again.